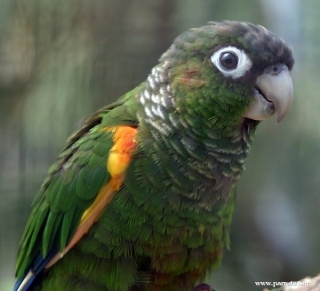 The Pyrrhura conures are known as the escape artists in aviculture. Their inquisitiveness leads them to investigate any and every way possible to get out of their enclosures. P.e. egregia: Both adults green breast with yellow/white and brown barring; brown/red centre of abdomen; yellow bend of wing, carpal edge and lesser underwing coverts, marked with orange/red; brown/red uppertail, dark grey undertail. Bill horn in colour. Eye ring bare and white. Eye brown. P.e. obscura: Both adults as in egregia, but with darker green upperparts and slightly darker green underparts; brown/red on abdomen minimal or absent. P.e. egregia: Green carpal edge and lesser underwing coverts; breast has less barring. Calls made in flight are described as harsh and grating, heard before the birds are seen. A Guide to Popular Conures As Pet and Aviary Birds, Dorge and Sibley, 2001. Aviary or suspended enclosure, minimum length 2m (6.5 ft). Fruit such as: apple, pear, orange, banana, pomegranate, cactus fruits, forming about 30 percent of the diet; vegetables such as: carrot, celery, green beans and peas in the pod; green leaves such as: Swiss chard, lettuce, sowthistle, dandelion, chickweed; spray millet; small seed mix such as: canary, millet, and smaller amounts of oats, buckwheat, safflower, and a little hemp; soaked and sprouted sunflower seed; cooked beans and pulses, boiled maize and complete kibble. Provide bird-safe, unsprayed flowering, fir, pine or willow branches, wooden and vegetable tanned leather toys, heat-sterilized pine cones, puzzle/foraging toys, swings, ladders and ropes. Vertical box 10" x 10" x 28" (25.4cm x 25.4cm x 71cm). P.e. egregia: Highlands of W Guyana, SC Venezuela, and N Brazil. Found from 700-1800m (2296-5904 ft) in mountain forest and forest edge, including tall, dense secondary growth areas. May also visit village gardens and parks. Seen in pairs or small family groups during breeding season; at other times in noisy flocks of up to 20 birds. Resident. Difficult to spot while feeding or resting in dense foliage.